Winner of Special Narrative Award, ARC festival in Germany, The Grand Prix at the 4th International Documentary Film Festival and Transmedia (RIOS) in Portugal, The Best Documentary film at the Lifft India Awards in India, and The Best Foreign Language Documentary Film Award in 2017 Cardiff International Film Festival in Wales. 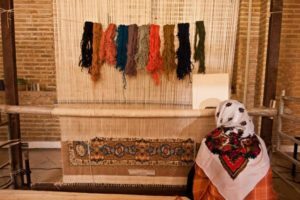 WEAVERS OF IMAGINATION recounts the life of a number of visually-impaired people who weave rugs together and how the simple fact of working together fills them with a great sense of happiness. Directed by Sadegh Jafari. 2017. 21 min. Persian with English Subtitles. THE SEASON OF WARM BREEZES follows a teacher in Iran’s Sistan and Baluchestan Province who tries to eradicate illiteracy among female residents. She, who had been unlettered till the age of 12, sticks to her roadmap to educate girls and women. Winner of The Jean-Loup Passek Award for best short or medium international film of the Filmes do Homem – Melgaço International Documentary Film Festival in Portugal. Directed by Hossein Rigi. 2017. 43 min. Persian with English Subtitles.